If one person in the world has a woodworking or cabinet design question there is someone somewhere in the world seeking that same answer. We’ve captured some of the most common questions we’ve received and provided you with the answers right here. If you have a question and you don’t find the answer here please write us at help@sketchlist.com and we’ll get back to you ASAP. Heck, you might even see your question below one day. What would be the best package for me and my needs: Shop or Pro? It is difficult to say. Best advice in buying ‘tools’ is to get the best or most comprehensive you can afford. The Shop version of our furniture design software is for the casual woodworker who is interested in designing in 3D, but because of budgetary constraints is willing to put more time in generating output necessary for building in the shop. The Pro version allows more assemblies and most importantly a photo quality image of designs. The Pro version will also output a DXF file for input into a CAM system. If you make money woodworking – you want the Pro version. A comparison is on the buy page of the website. If you have V3 and want to move up to V4 – purchase a copy of V4 and install it on your computer. There is a video at www.youtube.com/watch?v=pzGKREuqLnI to help you convert. I can’t activate SketchList Pro on my new computer. It tells me I have used the activation number already. Apparently the key had been registered on your old computer. You need to uninstall that and send in for a new key. It may be that you need to temporarily disable the security software on your computer if that is interfering with SketchList 3D’s ability to access our server and valid your key. This is a one time function. I purchased the new SketchList 3D Pro, and installed it on my computer. I have since purchased a new computer, and I am trying to move SketchList to the new computer. The license key doesn’t work. Download SketchList 3D to new/fixed computer. On old computer export all projects you want to move. Copy them onto a movable storage device. On new computer import saved projects. Delete copy of SketchList 3D from old computer. Email SketchList confirming deletion and requesting a new key. Enter key on new copy of SketchList 3D to activate. Remember unless you purchased more than one copy you are licensed to run SketchList 3D on one computer only. Running on more than one is a violation of the license which may be terminated by SketchList at any time. Norton tells me not to trust SketchList. What should I do? Well I don’t necessarily trust Norton 🙂 Our software is scanned for viruses before we distribute it. We have thousands of downloads and have never been informed of an issue related to our software. Ultimately it is your call. Disable Norton or otherwise Allow it to accept the SketchList 3D download, or not. Does SketchList 3d work on a 64 bit PC system? When do you expect to have a Mac version? The Mac version of SketchList 3D has been out for several years and is completely functional. Can I purchase now to start with the Windows version, and then switch to Mac? Yes – but you can only get a key for one computer. Will an iPad app be available for this program? We are currently designing concepts for an iPad version that may be available in the future. Once more information is available we will send a notice to our community and post an update. but are not committed to moving to that platform. Is the software easy to learn? Ease of use is a personal assessment. We have had people generate complex designs within a day or two of downloading the trial copy. For some, it takes longer. Most say that SketchList 3D is much easier to learn than traditional CAD systems. Users proficient in those systems have moved to SketchList because it is more productive and easier to use. To make your own decision on the ease of use, view the videos. If they seem understandable, download a trial and see for yourself. Can I import projects from Google SketchUp? No. In order to achieve SketchList’s ease of use, it is radically different than that other package. Is it possible to make sure boards don’t bump into each other, i.e., not occupy the same space at the same time? Not in any restrictive way. The tradeoff is that during design time – as boards are moved around – there are times when ‘bumping’ happens and restrictions would impede progress. For example a board with a tenon would ‘bump’ into the board with a mortise. The test of seeing that boards are butted and not overlapping to so see in the board spreadsheet that – for example – the right side of one board is less (spaced) or equal to (butted) that of the left side of the second board. How do you create a dovetail? A dovetail joinery type is applied to the edge of a board. Basically, you specify the height and angle of the dovetail. 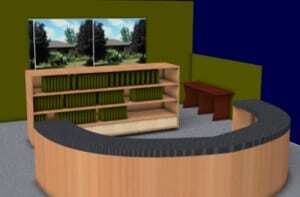 You can dovetail a surface with the shaping tool within our furniture design software. Will your program design pharmacy furniture, or you do have a specific program for that? Yes, SketchList 3D will allow you to design any type of cabinet or storage unit. What may be specific to the pharmacy, I do not know. One area I spent a long time on was shaping. Other software I’ve tried does not typically limit shaping to the surface side only and allows it to also be done on the edges. SketchList 3D says this is not possible. I wondered why? Shaping only the two surfaces is a limitation and relates to how we viewed a board when we created SketchList – mostly concerned about joinery back then. The question is do we make all ‘surfaces’ able to be shaped OR do we provide functions to help users more easily accomplish the shapes without the work. 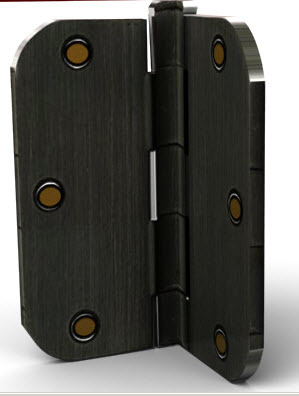 What about a library of hardware – or doors or drawers for that matter? We provides a library in the database that is part of the package. Also you can buy a library of appliances if you wish. See the buy page of this web site. Any standard object that is not provided only needs to be created and saved once by the user. Then it is available forever in your library. Can you simulate wood bending in SketchList? I’m designing a bed with an arched headboard that has a molded cap on top. To build the molded cap i want to bend and epoxy several thin splines of wood against the mold. I have found in the material shaping function how to cut arch shapes into wood, but there doesn’t appear to be a function for actually bending a board into an arch? You might take a board and shape it to affect the curve. I have done this and it works to a large extent. SketchList does not bend wood. 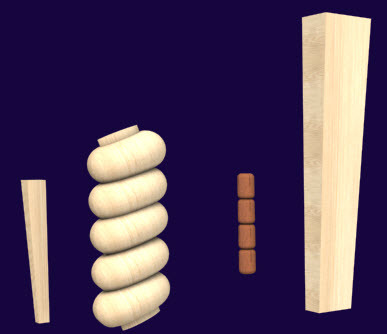 Can you simulate wood turning objects… for example if i needed to turn a wooden leg for a chair? Yes. Yes this blog post. How can I easily add double lines of shelf pin holes inside cabinets and bookcases using your furniture design software? We have a clone and space function for holes so you can take 5mm or 1/4 inch holes and space them every X distances apart. Having played around with SketchList 3D a bit now I was wondering if there is an option for all materials to be in millimeters as we rarely use inches in Britain. You can create materials either as imperial or metric system sizes. Does the application check for upgrades or do I have to download the update? At this time each time you start SketchList 3D and are connected to the internet, the software checks the automatic upgrade checker. Is there a method that I can delete previously created “standards”? I’ve accumulated a lot of junk in that database and would like to eliminate those standards that are in error or no longer used. Yes you can. Just select the standard object and click delete. I need a little help on one of the attached files. I am attempting to make dental molding that wraps around the side of my wall cabinet. Two approaches to dental molding. One is to cut non-round holes and then clone and space them over a given distance. The other way to to take a small block and do a clone and space with that — that works in the current version. Can I copy a drawer from one assembly to another? You can select the drawer (or board, or door, or assembly) and make it a standard. Then you can call that standard into other places. Is there any way to delete dimension drawings? We have implemented the ability to delete dimension lines in a drawing and delete old on unwanted drawings. Is there a way to upload custom textures for the board materials. It would be great to have textures that are transparent for glass or brick and stone for use as a fireplace surround. You can import any image file as a texture then set the degree of transparency. Below is an interesting use of the technique. In this case the ‘texture’ is a television. What do I do if I have some other question? Send an email to dave — at — sketchlist —- dot —- com. Or go to www.sketchlist.com and search for the subject with the search function. Or attend an online training by SketchList. How do you zoom an area on a design screen? 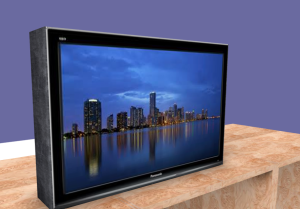 Zooming an area of the screen requires to hold down the control key, the left mouse button, and moving the mouse. Another way is to type the M key on your keyboard to open a magnified area of the image. Type M again to close the magnifier. How do you create a dimensioned shop drawing? The grain direction on my optimized layout diagrams is wrong. What happened? The optimizer is very reliable as one of the oldest features of SketchList 3D. Every time someone asks a question like this – well sorry but – the cause has been user error. You must make sure the grain direction of the board is going the way you intend AND the grain on the material in the material database is also going in the correct direction. 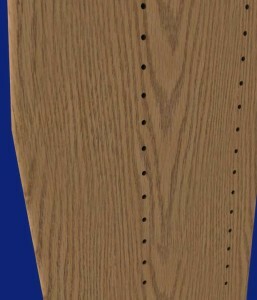 Sometimes people create a board or a material and leave the grain direction unchecked – which defaults to “It doesn’t matter to me.” At that point SketchList 3D optimizer will place the boards to minimize waste and you may get a board with a grain that goes front to back and not up and down (or whatever you expected). Please double check and you will save time. I need to rabbet a door so I can inset it into the frame. How? Size the door and rabbet all four edges. At board detail level click the joinery button. Select rabbet and pick all four edges. How does SketchList let me change dimensions? The sizes and locations of parts in SketchList 3D are changed using either the form on the upper right or the spreadsheet on the bottom of the main form. Another option is to right click the red dots on the object [turn on red dots with red dot icon and top of main form.] and type in new size. Or you can drag the red dots to the size you want for the object.